The issue of global warming is an oft debated subject these days, and with such impressive heat and drought conditions plaguing the country, it certainly appears we’re on our way towards a warmer climate. However some recent studies suggest several factors could actually be cooling the climate, and the NOAA announced last week that the back-to-back La Nina years in 2010/2011 cooled the globe. “Researchers are working to identify exactly how a changing climate will impact specific elements of weather, such as clouds, rainfall, and lightning. A Tel Aviv University researcher has predicted that for every one degree Celsius of warming, there will be approximately a 10 percent increase in lightning activity. “This could have negative consequences in the form of flash floods, wild fires, or damage to power lines and other infrastructure, says Prof. Colin Price, Head of the Department of Geophysics, Atmospheric and Planetary Sciences at Tel Aviv University. 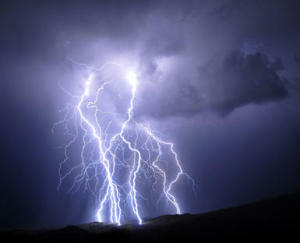 In an ongoing project to determine the impact of climate change on the world’s lightning and thunderstorm patterns, he and his colleagues have run computer climate models and studied real-life examples of climate change, such as the El Nino cycle in Indonesia and Southeast Asia, to determine how changing weather conditions impact storms. An increase in lightning and intense thunderstorms can have severe implications for the environment, says Prof. Price. More frequent and intense wildfires could result in parts of the US, such as the Rockies, in which many fires are started by lightning. A drier environment could also lead fires to spread more widely and quickly, making them more devastating than ever before. These fires would also release far more smoke into the air than before. Researchers predict fewer but more intense rainstorms in other regions, a change that could result in flash-flooding, says Prof. Price. In Italy and Spain, heavier storms are already causing increased run-off to rivers and the sea, and a lack of water being retained in groundwater and lakes. The same is true in the Middle East, where small periods of intense rain are threatening already scarce water resources.” To read the full artice, click here. Actually, “real” normal should be kicking into gear early next week after our routine of storm systems head on out of here. Boy they’ve been taking their time, haven’t they? In case you’re worried about your weekend plans being ruined, let me at least assure you one out of your two weekend days will be pleasant. This time, the nice weather day will be tomorrow as a rather flat ridge of high pressure builds in which means morning clouds and possible drizzle, followed by afternoon sun. Highs will “soar” into the mid 70s. Sunday and Monday are shaping up to be rather cloudy/showery/cool…kind of like today without the rumbles and flashes of lighting. Highs will drop into the 60s to near 70 degrees. And then…finally…we warm up and clear out. But shhh! We need to be more discreet about the forecast. It seems like every time there’s a mention of sun or mild weather in the 7 day forecast, some curve ball is thrown and we’re stuck with rain and 65 degrees! But most models seem to agree on at least warmer and sunnier weather as we head into next week. More updates to come! For now, have a great weekend everyone! It is truly amazing to hear about the dreadful heat and drought conditions in the east, some of which the worst in 50 years. I wish we could push some of–or all of–the moisture here to the areas that need it, but the weather models are consistently bringing system after system into our region making for a cooler and slightly wetter than normal weather pattern. And, to add to all of that, we may have a run in with thunderstorms again. That’s right! The Seattle area averages about 7 thunderstorms a year, making it one of the rarest locations in the country to find such storms. But I heard we haven’t seen much in the way of thunder and lightning the past few years, so Mother Nature’s just trying to make up for it 😉 Your forecast tomorrow looks a bit cloudy in the morning, although with the strong summer sun those pesky clouds should burn away quickly and lead to more in the way of afternoon sunshine. Highs will bounce into the mid and upper 70s, which is a far cry from today’s 66 degree high temperature! A stronger onshore push will arrive later Thursday, but it won’t come without a bang. Thunderstorms will bubble up along the eastern foothills and Cascades, but could wander our direction through the night, so don’t be surprised to hear some thunder tomorrow night. Lows will be near 60. Friday onward the forecast becomes very uncertain. Weather models seem to think one thing one 6 hour time frame, and then switch to another concept in another 6 hour time frame. I mean, you’d swear we’re in winter! But the general consensus is: a cooler/cloudier start to our weekend with Friday being the coolest day with highs near 70. The sun returns briefly for yard work on Saturday before the clouds and showers return for Sunday. Then, we should make a gradual change to more summer-like weather as next week progresses. 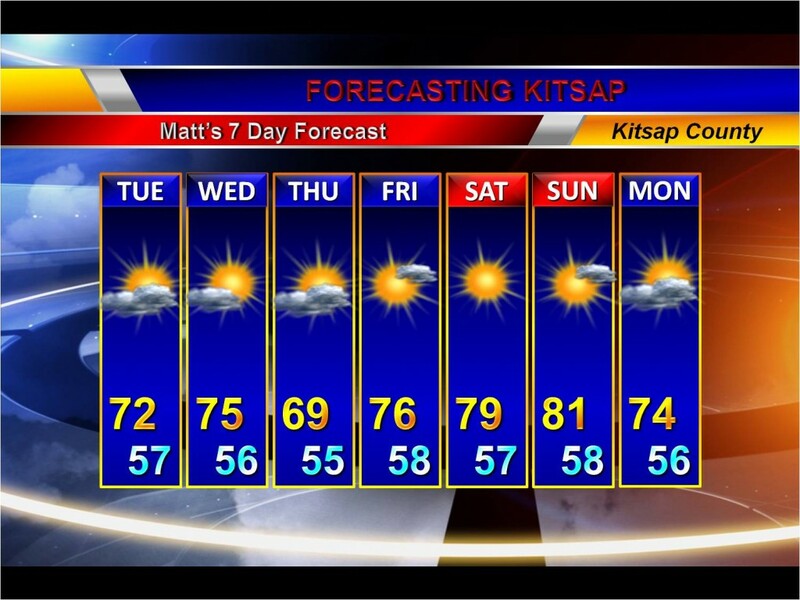 Highs should eventually make it to near 80 by this time next week. Back to the present, we’ll see mostly clear skies tonight except for the chance for a stray thunderstorm or two that could pop out anytime between now and tomorrow afternoon. These pesky systems are hard to track, and they seem to come at random, so just be warned you may see flashes of lightning accompanied by loud claps of thunder tonight. Lows will dip into the upper 50s. Tomorrow will remain mostly sunny with, again, the chance for an afternoon thundershower. Highs will warm into the upper 70s to near 80 degrees. With onshore flow a little stronger, Wednesday will feature more in the way of cloud cover with highs cooling back into the mid 70s, but it looks like we’ll make a gradual warming trend as we approach the weekend, and we may see much warmer weather by early next week. Too early to tell just yet as models have been flip-flopping almost as bad as they do in the winter, so stay tuned. For now, be safe and enjoy your Monday evening! 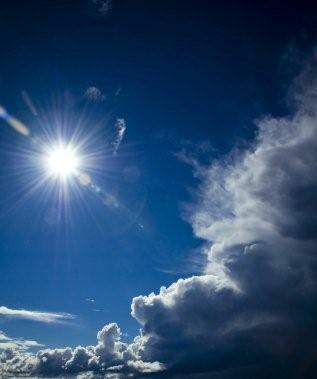 .NOW… THUNDERSTORMS WERE DEVELOPING OVER THE CENTRAL CASCADES LATE THIS AFTERNOON. THESE STORMS WILL MOVE WEST…REACHING THE SOUTH SOUND REGION AND SOUTHWEST INTERIOR OF WASHINGTON BY 7 PM. THUNDERSTORMS WILL CONTAIN DANGEROUS CLOUD-TO-GROUND LIGHTNING…INTENSE BURSTS OF RAINFALL…AND SMALL HAIL. IF YOU HEAR THUNDER…HEAD INDOORS. Thunderstorm activity is likely tonight and through most of tomorrow, so be warned that we’ll still be up against some stormy weather until Sunday. It appears like we’ll see more sunshine tomorrow than we have today, so expect partly sunny skies with scattered thundershowers throughout the day. Highs will be a bit warmer in the mid 70s. Sunday will be a little more on the cloudy and cool side as a stronger front moves into the region, bringing some rain showers with it. Highs will struggle to make it much beyond 70 degrees. **UPDATED 10:56 AM, Friday July 13th, 2012. **As you’re out storm chasing today, snap some cool photos and send them to me at: forecastingkitsap@live.com ! .NOW… AT 1045 AM…A BAND OF THUNDERSTORMS STRETCHED ACROSS THE SEATTLE METRO AREA FROM NEAR NEWCASTLE…THROUGH SEATTLE TO POULSBO AND ON TO QUILCENE. THE BAND OF STORMS IS SLOWLY SPREADING SOUTHWEST NEAR 5 MPH. THROUGH 1 PM…THE MOST CONCENTRATED AREA OF THUNDERSTORMS WILL SPREAD SOUTHWEST TOWARD BLACK DIAMOND…DES MOINES… BREMERTON AND SEABECK. THUNDERSTORMS WILL BE CAPABLE OF PRODUCING SMALL HAIL…INTENSE RAINFALL AND DANGEROUS CLOUD-TO-GROUND LIGHTNING. IF YOU HEAR THUNDER…GO INDOORS. Well, hello Friday the 13th! How appropriate that we’d be talking about thunderstorms on a day like this 😉 Did you notice it feels a little more humid this morning than usual? The weather lately has been more reminiscent of Kansas City, Missouri than Seattle, Washington, especially when seeing the humidity at 85%! 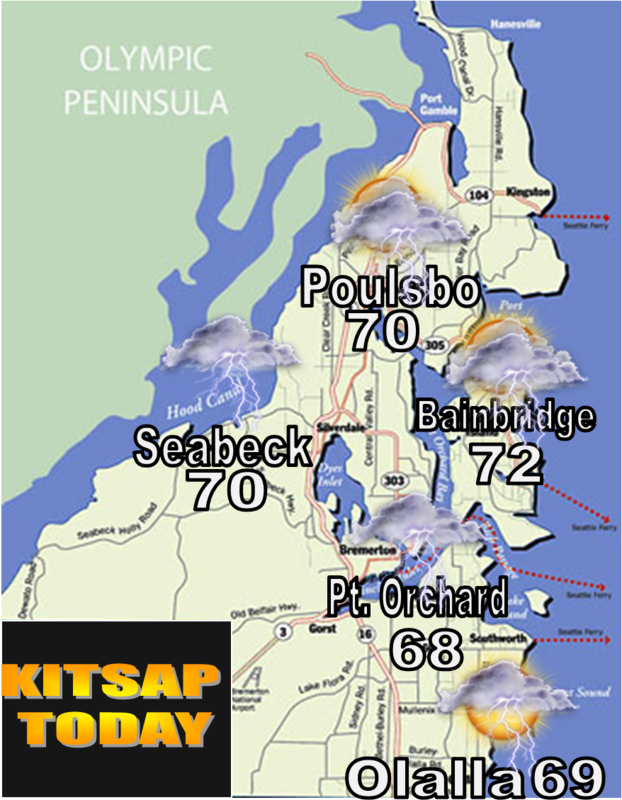 Like many of you, I was up last night tracking the brief hail/rain shower than moved through the central Kitsap area which also included thunder and lightning at times. Now it appears we could be under the threat for more of these storms over the next couple days as the atmosphere remains rather unstable and easterly flow pushes a lot of these storms from the mountains into the lowlands. Currently we are under cloudy skies as a result of the marine layer that moved in overnight, but the issue here is what’s ABOVE the marine layer. The unstable airmass aloft combined with persistent easterly flow will keep the threat for thundershowers, hail and periods of lightning in the forecast through Sunday night. Summer months in the Pacific Northwest are indeed among the most pleasant you’ll find anywhere. Of course, that’s my opinion, but it’s hard to beat a Washington summer. Although we’re so close to the Pacific Ocean, the air remains dry and humidity stays low until fall. On occasion, however, we get some interesting summer weather (like Monday morning!) and on even rarer occasions, those very weather events repeat themselves. This is a fancy way of saying…if you missed the lightning show late Sunday night/early Monday morning, you MAY get another chance to see some flashes this upcoming weekend. But first, I’d like to share a picture Forecasting Kitsap blog reader Andrew shared with me a couple days ago. Below, you’ll see an annual rainfall map for Western Washington. Notice the multiple shades of color on the Kitsap Peninsula, reminiscent of the temperature shades we observed a few days ago on a different map! The micro-climates on this peninsula never cease to amaze me. Observe how the northern tip of the peninsula averages about 20-30 inches of rain while areas around Shelton and Belfair experience between 60-80 inches per year! Imagine…we all live in the same general area, yet annual precipitation totals can average a difference of as much as 60”! Incredible. Luckily we won’t have to start worrying about precipitation amounts for a little while, but we could get a little damp over the next 24 hours due to a low pressure system sliding it’s way into our region, triggering more in the way of morning clouds and drizzle followed by afternoon sun. Highs the next few days will struggle to get as warm as they got today, although we’ll still we temperatures bounce to the mid and upper 70s after the low cloud cover burns away. But! Be it known: the atmosphere will destabilize this weekend as a result of the incoming low pressure system, so the the mountains and foothills are highlighted for a risk of thunderstorm activity, but all we need is the right ingredients to get some of those storms blown our way and we could have a repeat of Sunday night. Of course, this is really all speculation, but the chances are at least there. We’ll see what updates occur between now and then. The long range forecast is quite uncertain. I don’t recall seeing weather models struggle this much forecasting weather events in the summer months here, but there doesn’t seem to be a firm grasp on whether we’ll return to very warm, very cool or seasonable temperatures over the next 5-10 days. For now, I have projected seasonal temperatures Monday onward, but keep checking back for further updates! 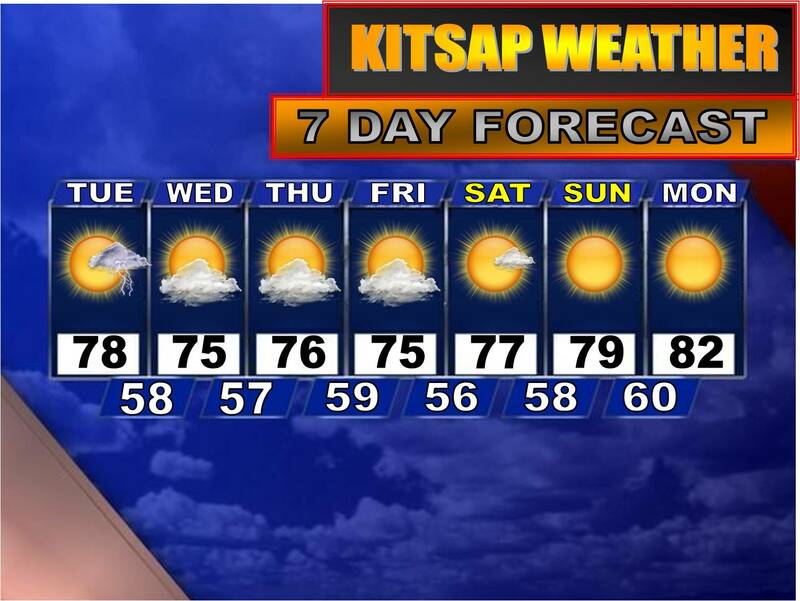 For now, enjoy the seasonable weather ahead! Thanks, Shawn! And, much to my disappointment, the storms are over for now. Thank you to all the commenters around Kitsap from Port Orchard, Bremerton, Silverdale, Poulsbo, and Suquamish. As we all know, the weather is different everywhere you go. Most of us in Silverdale remained completely dry while residents in Poulsbo and Suquamish experienced pea-sized hail, gusts of wind and heavy downpours. 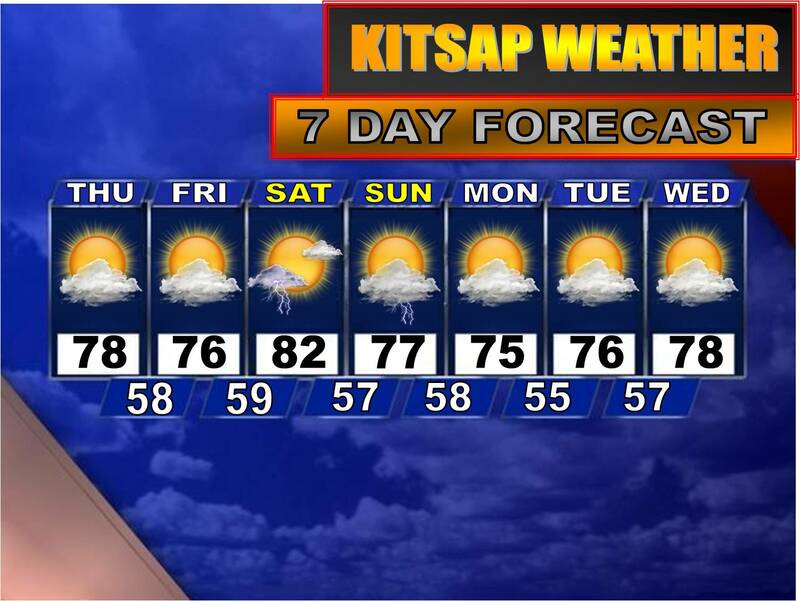 Keep your eyes on the skies and e-mail any cool weather pics you have to: forecastingkitsap@live.com and I’ll be sure to share. As for your 7 day forecast, expect more in the way of morning clouds over the next couple of days, although Wednesday through Friday looks gorgeous with morning clouds giving way to warm afternoon sun. Highs will range from the mid 70s to low 80s. What in the world happened last night?! At around 12:00 am this morning I saw a bright flash of light, followed by low rumbles and the first thing that came to my mind was: fireworks! Pretty late in the game to be setting them off, but some people just can’t let it go. Of course, it wasn’t fireworks at all. Western Washington had its rare taste of summer thunderstorms, and unexpectedly at that! So, like any weatherman would do, let’s start with the excuses as to why that happened. 🙂 Rather impressive thunderstorm activity developed over the Cascades (as expected), but thanks to some strong upper level winds those storms were carried over the mountains and through the woods right into our neighborhood. The lightning show didn’t last very long, and if you were sleeping at around midnight last night, it’s likely you didn’t even know anything out of the ordinary happened. For those who like thunderstorms, what we just experienced was pretty lucky. It’s hard to get genuine thunderstorms here because of our typically cool, marine climate, so if we are to ever get them, it’s in the summer time. Be advised, however, that over the next 24 hours the cascade mountains are still expected to experience some pretty stormy and unsettled weather. Also, you may notice the clouds this morning. This is due to the onshore flow, or marine influence, spoken about in the previous blog post. Don’t worry, your picnic isn’t ruined! In fact, we’ll likely dance on either end of 80 degrees today once the clouds burn away. Marine clouds will be pesky tomorrow as well with temperatures stalling a bit in the 70s, but Wednesday skies clear and give way to upper 70s/low 80s once again. Ahhh…now THIS is more like it. Today’s official high temperature at Bremerton airport is 79 degrees (as of 4:15 this afternoon, anyway) while other weather stations in Poulsbo and Port Orchard are showing 83 and 81 degrees, respectively. Are you ready to get warmer? 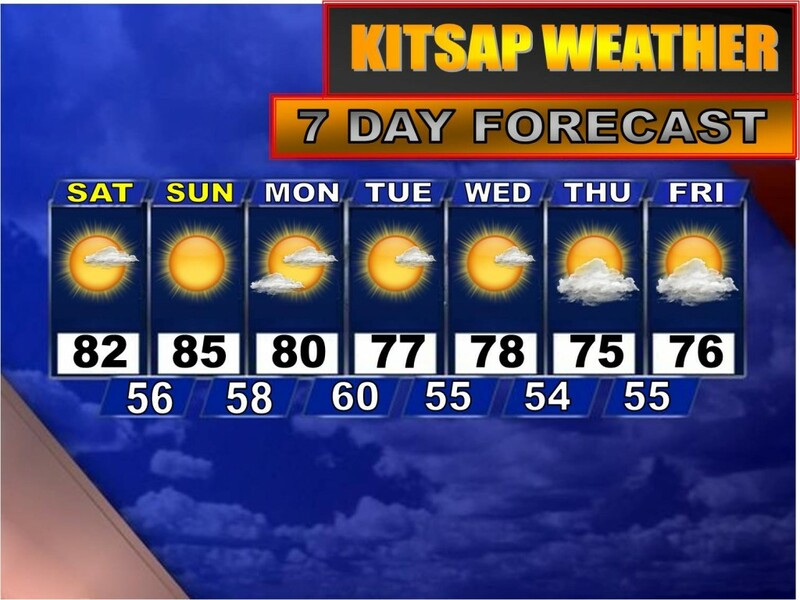 This weekend will be the nicest one we’ve had since…mid May! And even then, temps were “only” in the upper 70s/low 80s. A slowly building ridge of high pressure is amplifying the conditions for warm and dry weather this weekend, although we don’t really have anything out there weather-wise helping us reach record highs. Remember July 2009 when we reached the triple digits? Yeah, that wasn’t just due to natural summer sunshine, that was due to anomalous heat spilling over from Eastern Washington in what is termed as “offshore flow”, hence the flow was coming off the mountains, not the beach. But over the next several days, while “onshore”, or “marine”, influence will be slight, there will be just enough of a cool ocean breeze to keep temperatures from achieving their full potential. This is similar to what happens in the winter here. Remember, if we want a good snowstorm we need lots of moisture (the ocean) and lots of cold air (the Cascades), but we must get both of those ingredients from opposing sources. Any cold or heat we get from the east is usually extreme in nature, but because of our close proximity to the ocean, more often than not things end up getting neutralized. Monday through the week next week looks largely comfortable and pleasant. Clouds will increase as the week goes on, as well as the marine push, but high temperatures will still stay near or slightly above average despite the sea breeze. Expect daytime highs in the mid 70s with lows in the low to mid 50s.